Christmas Afternoon Tea is a long time family tradition. closed the tea room in July 2004. Our family informed him he had ruined our Christmas tea tradition! serve a better Christmas tea at home. but they were pre-digital camera I've not yet scanned. Here are a FEW of our Christmas photos taken at various locations after 2004. 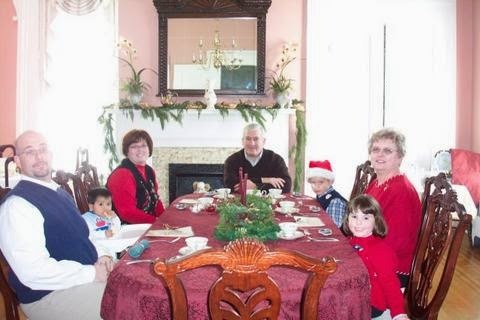 Our first Christmas family tea in the "tea room"
Photo below in our home "tea room"
from Kentucky Living Magazine, November 2013. The editor called when she heard of our family Christmas tea tradition. What a wonderful Christmas tradition! And I cannot believe your tea room addition dates back to 2009. I remember "being there" (in cyberspace, anyway) for it, as you waited on it to come to life, and I can hardly believe it's been five years now. We've been friends that long? Yes, I guess so! How wonderful! That's the perfect Christmas tradition....train them up young and continue! Well done! I enjoyed your post so very much! How wonderful your family enjoys tea time! Merry Christmas!